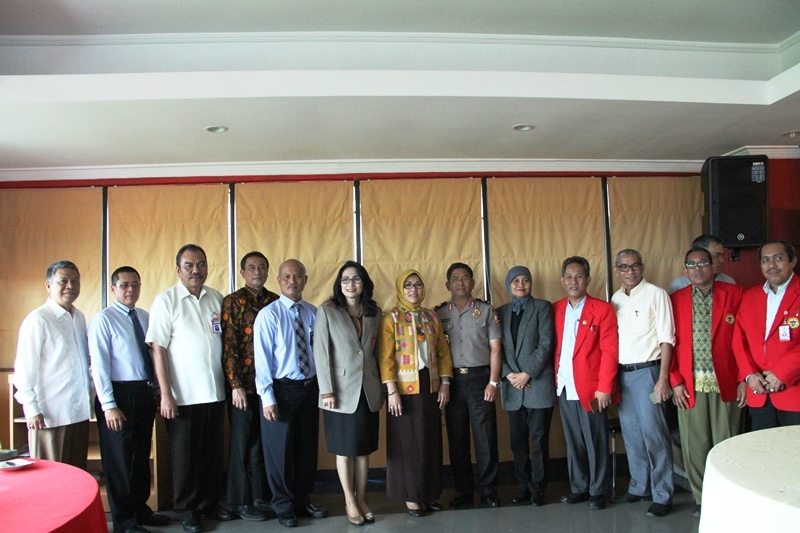 Police Academy Higher Education Institution of Police Science (STIK-PTIK) embraces Universitas Hasanuddin in the form of partnership with aims of advancing the quality of human resources that the Police Academy comprises of. The partnership is realized in the form of a MoU signing between Unhas and STIK-PTIK conducted by the Unhas Rector Prof. Dr. Dwia Aries Tina Pulubuhu, M.A., and the Vice Head of STIK PTIK Brigjen Pol. Drs. Djati Wiyono, S.H., M.H. in the Unhas Tamalanrea Campus, Tuesday (22/11). Similar cooperation has been vocalized by the Head of BRI Makassar Ngatari in accordance to the Micro Finance Education with the Faculty of Economic and Business Unhas. Brigjen Pol. Drs. Djati Wijono stated, similar cooperation have been maintained by Unhas in the morning of that day with the Government of Makassar that would eventually involve Unhas, especially when it concerns the field of education. “For example in the establishment of lecturer careers, for instance allowance to teach in STIK PTIK, which throughout the years have been done by UI and ITB,” stated Djati Wijono during the event that was attended by Unhas officials, STIK PTIK and BRI. Djati Wijono stated, STIK education must contain the need of strengthening and sociological approaches. Unhas in the future is hoped to develop cooperation of police sciences to construct a modern, professional, and trusted police. During the occasion, Head of BRI Makssar Ngatari in his speech stated that the cooperation with Unhas in the field of micro finance (small scale finance) is one of the right choices. The development of micro finance in Makassar still is leading in Indonesia, including its retail sector. “Out of the 19 regional offices of BRI in all over Indonesia, we are ranked first when it comes to credit amounts. The past nine months, the credits released reaches IDR 12,5 trillion, not including Southeast Sulawesi, West, and Ambon,” stated Ngatari. According to Ngatari, the profit attained by BRI Makassar is IDR 2,4 Trillion as of September 2016, the highest in Indonesia. Therefore, as a partnering institution, several times past, BRI gave for their corporate social responsibility, 100 motorcycles to the South Sulawesi Regional Police Department, and will also apply for the Police Departments in West Sulawesi and Southeast Sulawesi. Specific for the creative house planned to be constructed from the cooperation with Unhas, Ngatari states that the President-Director of PT. BRI, Asmawi Syam has targeted to inaugurate on the 10th of December 2016 by the Minister of BUMN. Unhas Rector Dwia Aries Tina Pulubuhu states, the major obstacle for Unhas as an Autonomous Institution is how to maintain cooperation with partnering institutions to solidify the qualities of scientific research and human resources of both institutions. STIK is an educational institution that is managed by the State Police, and Unhas will be ready to fill in the gaps of the cooperation. “There are 80% of the educational staff of Unhas with Doctoral qualifications that are ready to contribute to the human resources of the STIK PTIK,” stated Dwia. As an Autonomous Educational Institution, Unhas is able to open and close study programs based on the demand of partnering institutions, therefore can concern the development of human resources of the state police, as well as for BRI. As of now, the cooperation with the police has been implemented for quite a while, for example with the Bachelors Degree program for investigators in the Regional Police Department of South and West Sulawesi. “There are even a countless amount of lecturers that have been appointed as expert staff, including the one currently speaking,” stated Dwia that was responded with laughs by the invitees. Specifically for the micro finance institute as a form of cooperation with BRI, Dwia stated that Unhas will prepare a creative house that would facilitate the academic elements of Unhas to develop their creative and entrepreneur thought.